Bottom club Sunderland earned a stunning win at Chelsea that severely dented the Blues' title hopes and gave leaders Liverpool a major boost. Connor Wickham followed up Marcos Alonso's shot to equalise after Samuel Eto'o had given Chelsea the lead. 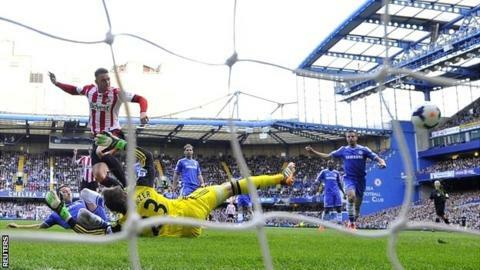 After several Chelsea chances, Sunderland were given a penalty when Cesar Azpilicueta fouled Jozy Altidore. And Fabio Borini scored to inflict Jose Mourinho's first home Premier League defeat in 78 games as Chelsea manager. The award of a marginal penalty so late in the game sparked anger on the Chelsea bench and Mourinho had to restrain assistant coach Rui Faria, who was seeking to confront referee Mike Dean. Faria was sent to the stands to watch the final stages as the match - and quite possibly Chelsea's chances of winning the league - fizzled out. The shock result leaves the second-placed Blues two points behind Liverpool, who will play their game in hand against Norwich on Sunday before hosting Chelsea a week later. Meanwhile, Sunderland, who had secured a point at title-chasing Manchester City in midweek, closed to within three points of Norwich, who are occupying the final spot above the relegation zone. While the result was a huge coup for the Black Cats, it represents a devastating blow for Mourinho, who must rouse his men for their trip to Atletico Madrid for the first leg of their Champions League semi-final on Tuesday. Once again, the Portuguese was left lamenting the inadequacies of his strikers as the Blues only converted one of their 31 chances in the absence through injury of their top scorer Eden Hazard. The Blues had begun the match confidently, as Eto'o capitalised on some slack Sunderland marking from a corner to open the scoring. Willian's delivery found the Cameroon frontman, who pounced in front of Lee Cattermole to notch his 12th goal of the season from close range. Sunderland's equaliser also came from a corner as the ball was sent directly to Alonso in acres of space on the edge of the area. The Spaniard's low drive was only parried by Schwarzer and Wickham reacted quicker than John Terry to score his third goal in a week. Chelsea were denied a goal on the half hour when Nemanja Matic was adjudged to have fouled Jack Colback as he nodded the ball down for Terry to sweep home a volley. Shortly afterwards, Sunderland were saved by the woodwork as Vito Mannone somehow managed to deflect Branislav Ivanovic's header from point-blank range onto the underside of the bar. Sunderland were indebted to their goalkeeper three more times as he saved from Matic, Mohamed Salah and Willian. And in a frantic end to the half, two penalty appeals were turned down by referee Dean as Alonso appeared to handle inside the box and Sebastian Larsson shoulder-barged Ramires off the ball in front of goal. Clearly irked by what he saw as an unfair challenge, Ramires was lucky to escape punishment moments later as he elbowed Larsson in full view of Dean. Chelsea picked up where they left off in the second half as a brisk counter-attack ended with Eto'o sweeping narrowly past the post. Mourinho brought on Demba Ba for the final half hour, but even the in-form Senegalese striker could not find his range as he sliced horribly wide from Willian's cut-back. As the half wore on, the Blues' efforts became increasingly desperate and disjointed as they were repeatedly unable to produce a finish to beat Mannone. Chelsea's commitment to attack left them exposed on the break and they paid the ultimate price as Azpilicueta's slip let in Altidore down the right. Azpilicueta slid in to try to challenge the American and was ruled to have brought him down. Former Chelsea forward Borini, who is on loan from Liverpool, kept a cool head to slot the ball past Schwarzer to send the visiting Sunderland fans into raptures. Substitute Andre Schurrle responded with a dipping shot from 30 yards which again saw Mannone produce heroics to tip over, before the Italian confidently gathered a Terry header to snuff out Chelsea's last hope. Match ends, Chelsea 1, Sunderland 2. Second Half ends, Chelsea 1, Sunderland 2. Attempt saved. Demba Ba (Chelsea) right footed shot from the right side of the six yard box is saved in the bottom right corner. Branislav Ivanovic (Chelsea) wins a free kick in the attacking half. Attempt missed. Emanuele Giaccherini (Sunderland) right footed shot from outside the box is just a bit too high. Assisted by Ondrej Celustka. Substitution, Sunderland. Ondrej Celustka replaces Sebastian Larsson because of an injury. Sebastian Larsson (Sunderland) wins a free kick in the attacking half. Attempt saved. John Terry (Chelsea) header from the centre of the box is saved in the top centre of the goal. Assisted by Branislav Ivanovic with a cross. Attempt blocked. Fernando Torres (Chelsea) right footed shot from outside the box is blocked. Assisted by Demba Ba. Offside, Chelsea. Willian tries a through ball, but Branislav Ivanovic is caught offside. Corner, Chelsea. Conceded by Vito Mannone. Attempt saved. André Schürrle (Chelsea) right footed shot from outside the box is saved in the top centre of the goal. Assisted by Willian. Goal! Chelsea 1, Sunderland 2. Fabio Borini (Sunderland) converts the penalty with a right footed shot to the centre of the goal. Penalty Sunderland. Jozy Altidore draws a foul in the penalty area. Attempt missed. Sebastian Larsson (Sunderland) right footed shot from outside the box misses to the right. Assisted by Santiago Vergini. Attempt saved. Fernando Torres (Chelsea) header from the left side of the six yard box is saved in the bottom left corner. Assisted by Nemanja Matic with a headed pass. Corner, Chelsea. Conceded by Marcos Alonso. Attempt blocked. Fernando Torres (Chelsea) left footed shot from the right side of the box is blocked. Attempt missed. Fernando Torres (Chelsea) right footed shot from the centre of the box is too high. Corner, Sunderland. Conceded by Branislav Ivanovic. Attempt saved. Demba Ba (Chelsea) right footed shot from the left side of the six yard box is saved in the bottom right corner. Attempt blocked. André Schürrle (Chelsea) right footed shot from the left side of the box is blocked. Assisted by Fernando Torres. Corner, Sunderland. Conceded by César Azpilicueta. Demba Ba (Chelsea) wins a free kick in the attacking half.